The subtitle calls The [Unc]ommon Sense of the Immortal Mullah Nasruddin a collection of “stories, jests, and donkey tales of the beloved Persian folk hero.” Nasruddin, though, is more than simply Persian — he’s an avatar of the Wise Fool found in folklore everywhere. In this case, as editor/author Ron Suresha notes, the Middle East is home to a genre of mullah (or sheikh) humor that draws on Persian, Turkish and Arabic tales that probably originally drew on each other and perhaps, in my own estimation, derive ultimately from something fairly universal in human lore. The historical Nasruddin was a teacher, judge, courtier and community leader, transformed through the magic of folklore into a buffoon (and folklore does have a tendency to deflate the mighty). Suresha has given us a contemporary reworking of the tales (the stories fit for a general audience, at least — folklore also has a tendency to be somewhat raunchy, but those he has saved for another collection), organized according to the tradition of telling the stories of Nasruddin in sevens. The stories themselves are told somewhat artlessly, and to Suresha’s credit he has maintained the direct, unadorned style that is a hallmark of folk tales. It’s roughly chronological, but only roughly: there are stories of Nasruddin’s childhood (and he was something of a flake, even then), his young manhood, his married life (some of the funniest), and stories of his later years, which give us the reigning image of the mullah: a white-bearded sage riding backwards on his beloved little grey donkey (a compromise, he claimed, between where he wanted to go and where the donkey was headed), followed by a gaggle of students. This artless quality derives at least in part from Nasruddin himself, who is in the tradition of the Fool, one of nature’s innocents, with a direct way of looking at things that may not always make sense to the rest of us, but is always refreshing — Nasruddin seems to alternate between Village Idiot and Trickster, and one is never quite sure which is which at any given moment. Maybe it’s just that he marches to his own drummer — his contact with reality is sometimes delightfully loose. I had thought to outline a couple of stories as examples, but they are so tight and so strongly interrelated — and as often as not, so brief — that I found them impossible to summarize. The groups each focus on a particular part of Nasruddin’s life, and are often built around the same events, coming in from different directions and often coming to different conclusions. This is a collection to be taken in small doses. There is a pattern to the stories that too easily becomes repetitive if taken too many at a time, but in their groupings of sevens, they are a delightful break from the everyday world for an hour or two. Mr Tilendis is the Book Review Editor for Green Man Review. In the aftermath of the weekend’s snowstorm, New Londoners gathered at the Bean and Leaf on Sunday to listen to local author Ron Suresha read stories from his collection The Uncommon Sense of the Immortal Mullah Nasruddin. Nasruddin has been a popular folk hero in the Middle East for over 800 years; Suresha collected more than 350 stories featuring Nasruddin to include in his anthology, seeking to introduce the timeless folk hero and his humorous tales to a new, American audience. Suresha is a native of Detroit, but has lived in New London for six years. He studied creative writing at the University of Michigan and spent much of his adult life working in publishing. Fifteen years ago Suresha decided that he wanted to collect the stories of Mullah Nasruddin and incorporate them in a modern, vernacular English text. Over the following years Suresha read Nasruddin stories in Turkish, Hebrew, French, Spanish and German. He compared dozens of texts to compile his own version, choosing 350 of the most popular stories and jokes for his new English translation. The cover illustrator of The Uncommon Sense of the Immortal Mullah Nasruddin is also a local New Londoner, Sgott MacKenzie. After the reading, attendees were treated to cake and given the opportunity to buy signed copies of the book. The Uncommon Sense of the Immortal Mullah Nasruddin is available through Lethe Press, and can be downloaded to electronic book formats. Suresha also maintains a Nasruddin website: www.mullahnasruddin.com, where new stories are posted regularly and links to other Nasruddin sites are provided. Amos Lassen, GLBTQ book reviewer, included The Uncommon Sense of the Immortal Mullah Nasruddin on his list of top 10 GLBTQ books for 2010! …8. Ron Suresha, “The Uncommon Sense of the Immortal Mullah Nasruddin”. I said in my review that these are stories to “mull(ah)” over. While not really a GLBT book, Suresha is a gay author who has given us the definitive Nasruddin stories. Those are the top ten for now … Best wishes for a Happy New Year. Suresha, Ron J. 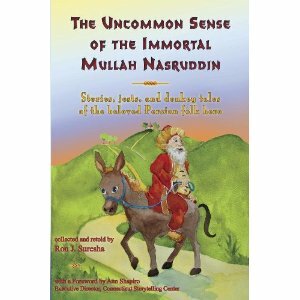 The Uncommon Sense of the Immortal Mullah Nasruddin: Stories, Jests, and Donkey Tales of the Beloved Persian Folk Hero, Lethe Press, 2011. Nasruddin was a Persian folk hero whose stories were popular in the Middle East. What was wonderful about his stories was and the beauty of them was that one learned a lesson while laughing. Many of us are not privy to those stories — or at least we weren’t until now. Ron Suresha has taken the stories from eight centuries ago and retells them for our time. Working with 350 stories that Suresha has amassed from many different sources and he gives what I am sure will be the definitive English version of the tales. The stories contain wit and wisdom and tell us about life, sometimes in ribald terms. Suresha, in making sure that he is retelling the stories in the correct tradition, gives them to us in groups of seven as the stories were related seven at a time. In this way, we can mull over what they have to say and gradually build up Nasruddin wisdom a little at a time. He has also arranged the stories chronologically from Nasruddin’s youth to his death. Nasruddin was a very wise man who had the gift of being able to make people laugh and as you read through the stories here you will feel the respect that Suresha feels for the man. His mother told him these stories when he was a kid and hence the relationship between himself and Nasruddin. He felt that the times had come to bring these stories to the English-speaking world and he actually began pushing for a publication some fourteen years ago. It was then, in 1997, that Suresha began his own modern retelling of the stories. His love for the stories is evident everywhere and that is one of the things that makes this book so special. He does not just retell the stories; he does so with love and respect. Interestingly enough, these stories also provide food for thought and show us something about the culture of Persia and the Arab world. Nasruddin has a story for every occasion and one of the beautiful things about his stories is that they can be understood on several different levels. While a story may cause a chuckle, you will think about for a while after reading it. It was Nasruddin’s philosophy to open “the listener’s (reader’s) heart with laughter, the tales provide a space for wisdom to enter”. Suresha has done the same thing in bringing us these stories and he has done so with style. I have always enjoyed reading Suresha’s work and this one differs a great deal from his other writings but the Suresha touch is still there. Having recently met Ron Suresha, I can tell you that he is much like Mullah Nasruddin — he can charm you with his wit and leave you musing over he said. We must all thank him for giving us the chance to read the stories of one of his heroes. Undoubtedly you will notice that I have not included any sample Nasruddin stories here and that is because I want all of you to approach the book blindly and become swept up in one of the most enjoyable reads that you will ever have.